I just looked back at a post from when Bubba was 18 months old and an eating machine. I just read about the variety of foods she would willingly eat and it's odd to see how that has narrowed. For this post I had to really think hard about the foods she will eat, she still has a healthy appetite but is picky (before even trying food) and I know if I can get at least one mouthful in her she usually then will eat the rest of it. It's a bit of toddler mistrust. I now try to feed her the same food we have eaten but usually a day later than us and this seems to be working well. Now she is more likely to cruise past the table and peer at the plate of food I've lovingly prepared before turning on her heal and declaring a defiant 'No me nots eat that mummy' and stalking off. I seem to use more bribery at the moment which is working well for us - so my usual would be 'please eat some of this and then you can have...' usually a pudding that I was already going to give her but still, it's getting food inside her. She will then eat the food she just minutes before turned her nose up at with gusto, usually finishing every mouthful and giving me a big cheesy grin. So I know it's not that she has gone off the food but rather she is asserting her authority. I also now have reverted back to feeding her the foods she is less passionate about, so she will sit and watch TV (I know, bad mother alert) whilst letting me shovel in the bits of the meal she doesn't feel suits her needs at that time. Another tactic is putting all of the meal (main and dessert) on the same plate - hubby calls this her prison slop plate but its a pretty Cath Kidston meal plate. I find she likes to eat a bit of spagetti bolognaise chased up with a few bits of pear, a bite of her babybel and then back to the spag again! 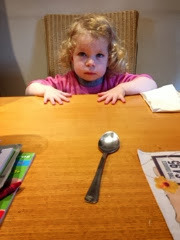 Last week I sat and watched as she first dunked her crusty bread into her orange squash and then ate the sopping mess. This was then followed by smothering (and it was properly smothered!) strawberry yoghurt onto the remaining bread and cheese and eating that. It got a bit messy but thank goodness she didn't cover her tuna as that would have been a step to far for my fragile pregnancy nausea. Vegetables seem to be her nemesis and all I can get inside her is broccoli - or carrot if its hidden in the food, same for mushroom and onion. She used to devour peas but will now avoid them at all costs, unless it's to walk round the living room with a packet of frozen peas and feeding her horse bullseye. She also now eats more processed meals - much to my husbands dismay. But with the onslaught of sickness (all about me again!) I've found it difficult to prepare her meals or even think about them without loosing my stomach. So I've relied on a few things such as children's spaghetti bolognaise and fish fingers with shaped pasta (I promised myself I'd never be that mother but I am, hey ho). Bubba is great at the moment when we eat out, she gets through a kids meal lunch box of sandwiches or carefully chosen hot meal - I usually stick to fish fingers or grilled chicken. Hates: Sweetcorn (she can detect it in anything! ), tomatoes, won't touch pate, fresh salmon or anything she thinks looks a bit iffy. Always followed by fruit, a yoghurt or both.